American Idol Top 24: Who Are Your Favorites? American Idol contestant Ashley Jones wows the judges during Hollywood Week. Last night we learned which remaining contestants would be joining the American Idol Top 24. There were a few surprises, a few major sighs of relief, and a couple "Bzuh?" decisions. From comments on sites like EW and TVLine, I'm sensing that James Durbin might not make it in the voting rounds, which I think is unfair. Much of the unrest seems to be because he dares to compare himself to Adam Lambert. Durbin is decidedly less glam and more Guns N' Roses, so it'll be interesting to see if maybe the dudes at home watching with their girlfriends might be compelled to vote Durbin in. I know the kid isn't perfect, but most AI contestants aren't. I'd love it if Durbin got the chance for some lessons with the vocal coaches and producer Jimmy Iovine on maintaining his control of the scream. But hey, Steven Tyler really seems to like him, so that's got to say something, right? Personally, I'm loving Ashton Jones, and not just for her amazing hair. She's got great pipes, in a traditional American Idol belter way--but so far without all the insane stylizing that can quickly get on my nerves. She's got good stage presence and fashion sense, and is what Jennifer Lopez calls "the total package." I don't think she's quite at the vocal richness of an 80s Whitney Houston, but I think she could get there. I also love Naima Adedapo, and every gorgeous flower she adorns her dreadlocked hair with. Unlike many of the contestants in their "Cowboy Barbie" dresses who are trying way too hard, Naima seems to know exactly who she is and what she likes. And she's got a killer voice. If you're looking at the row of American Idol Top 12 gals, your eye is going to go right to her. Once she's got your attention with her unique look, she reels you in with her powerful but controlled vocals. American Idol is known for ditching "quirky" at the outset and sticking with bland (see all last season), so here's hoping that Naima's sweet nature and colorful dresses lure some teen girls into voting for her. Want to know all about the Top 24? Read my complete rundown of the finalist American Idol contestants--12 Girls and 12 Boys. As always, you can find all of my AI recaps here. 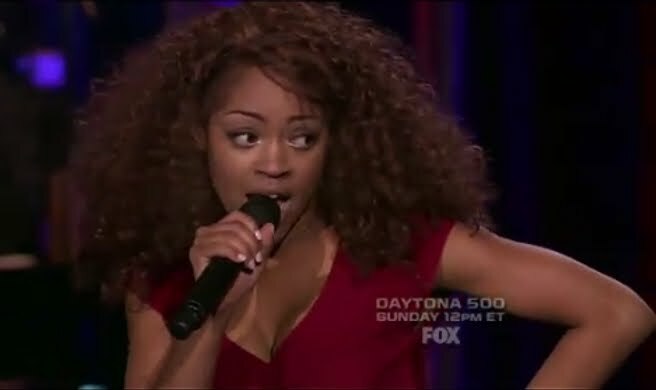 PHOTO: Ashton Jones performs during Hollywood week; screencap c2011 FOX.